Summary: If Hero was the trial run, House of Flying Daggers is the real deal. China, 859AD. The once flourishing Tang Dynasty is in decline, unrest is raging throughout the land, and the corrupt government is under threat from revolutionary armies. The largest of these is the ‘House of Flying Daggers’. Police captains Leo (Andy Lau Tak Wah) and Jin (Takeshi Kaneshiro) are ordered to capture the rebel leader and, suspecting that the beautiful blind dancer Mei (Ziyi Zhang) may be their best lead, arrest her and bring her in for questioning. When Mei stubbornly refuses to answer any questions, even under threat of torture, Jin agrees to pretend to be a rebel sympathiser called ‘Wind’, rescuing Mei from prison and thus winning her trust. Jin is an expert swordsman and a flirt, and sets out to charm and seduce Mei as he escorts her to the Flying Daggers’ secret headquarters. Initially Mei is wary, but as ‘Wind’ saves her life again and again she gradually warms to him, while to his surprise Jin finds himself genuinely falling for her. But can there be secrets between lovers? And what chance of happiness can there be for a police captain and a revolutionary? After the painterly, slightly ponderous epic of Hero, Zhang Yimou has produced another masterpiece, this time on a more intimate, human, and universal scale. Audiences will find ‘Flying Daggers’ with its pared down love story more engaging and accessible than ‘Hero’, though maybe, just maybe, slightly less ravishing. But it’s SOOOOOO much sexier. Who is Takeshi Kaneshiro? Half Taiwanese, half Japanese, totally gorgeous; he and Ziyi Zhang sizzle together. The scene in the Peony Pavilion where Jin cuts off Mei’s dress with his sword after she’s danced for him… phew! I immediately checked out his film credits and added them to my LoveFilm list. If he’s not snapped up by Hollywood I’ll eat my hat. Co-star Andy Lau is only slightly less attractive, but has a darker role, while Kaneshiro gets to play the hero, galloping around a field to gather wildflowers for Mei – who could fail to be seduced? 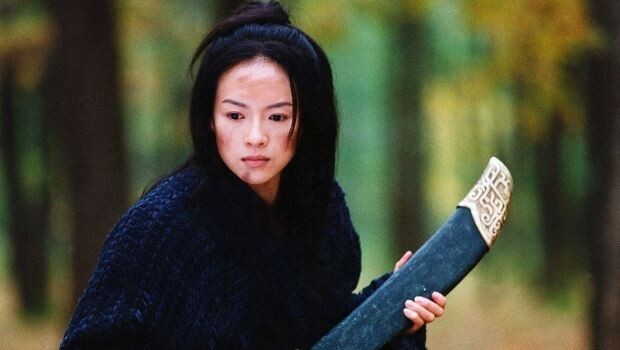 Fans of the beautiful Ziyi Zhang will be pleased to see that she gets a much bigger role here, and proves that her talents are not limited to wire work. She’s amazingly convincing as the blind Mei, her eyes slightly unfocussed as she uses her other senses to detect enemies approaching. I wasn’t surprised to find out that she had trained as a dancer and a gymnast. The echo game in the brothel is another stunning scene, with Mei dancing and using her long sleeves to play the drums – well, I can safely say you won’t have seen anything like it before. The Wuxia action elements here work better than in ‘Hero’ – they’re less dazzling and stately but equally spectacular and more real, especially the fight in the bamboo forest, which takes place on two levels. Zhang Yimou has said that after Hero he felt much more comfortable with the genre and it shows. The swordplay is amazing and the flying daggers themselves beautifully done, and the final big set piece, the fight in the snowy meadow, both gorgeous and frighteningly vicious. As the scene goes on, it become less balletic and far more raw, a proper smackdown, with one character giving another a Glasgow kiss. If Hero was the trial run, House of Flying Daggers is the real deal.